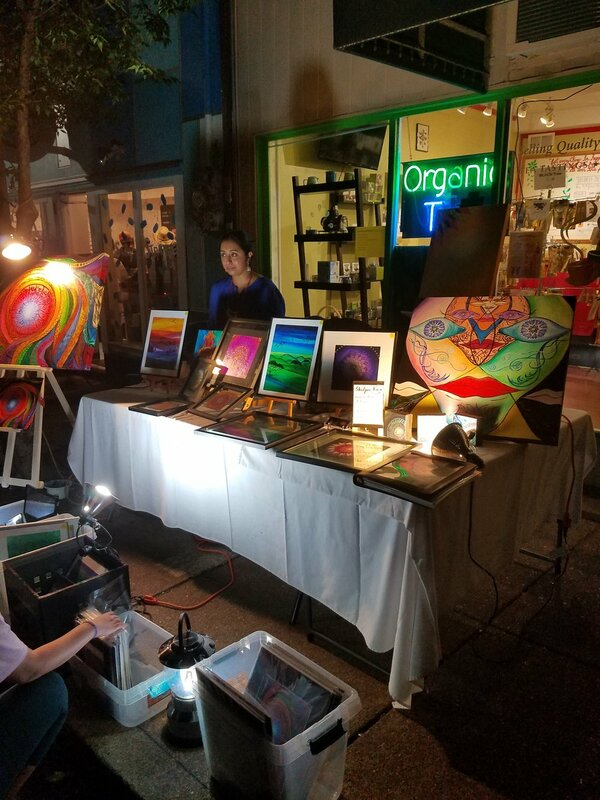 This past Friday, Friday the 13th, I visited Maplewood, Mo., with a friend, to attend “a celebration of making art and enjoying art,” hosted in the historic streets of downtown Maplewood in honor of Bastille Day. I didn’t really know what to expect at Let Them Eat Art, and never attended before, but upon arrival, I could tell this event was huge! Starting at 6 p.m. and ending at 11 p.m., there were many things to do and see, there were 50+ artists featured in the celebration this year, a whole host of bands to keep the crowd going all evening, and almost every shop along the self-guided tour opened their doors for the festivities. We arrived a little late, but the party was still raging on! We could see the crowds from the parking lot across the street. Once we made it across, we were greeted by good smells from the array of eateries that lined Manchester and the sounds of Saint Boogie Brass Band pumping up the crowd with some good brass beats. The music was accompanied by performers dancing with fire surrounded by art booths. We made our way through the crowd, looking at all of the art around us. There were booths in every open spot, all kinds of art and goods, all beautiful, some weird, but every single one, unique. We made our way down Manchester, taking in as much as we could. It was still fairly hot out, but that deterred no one. Even at 9:30 p.m., the event was still packed. We rounded a corner, onto Sutton, and there were even more booths, restaurants, galleries and even a second stage! I spent the rest of the evening there just taking in all the sights, sounds and smells. Let Them Eat Art is truly a well-rounded celebration of the arts. From street performers, to live art, amazing bands, and even puppets and dolls, it was truly a treat for any soul who loves to consume art. If you missed out on it this year, no fear, this is an annual event. I definitely recommend attending next year! If you’re still curious about what you missed, you should visit the City of Maplewood website and check its event calendar. There you can access the 2018 Directory of Exclusive Creations and see some of the wonderful art featured during this event.